Results/splits/maps for 6 hour race. Transfer buses will wait you at Cesis bus/railway station. Look around for our sign-board. You will find Competition Centre next to Riga-Pskov motorway (on the right, if going from Riga) close to bus station Kiegelceplis. Follow our road signs! Автобусы в Центр соревнований отходят в 13:20, 15:20, 20:20 из автобусно-железнодорожного вокзала. Смотрите вокруг за нашей табличкой. Центр соревнований находится у шоссе Рига-Псков, на правой стороне, если ехать из Риги. Следите а нашими знаками. Respect local people and their property. Most of the land and the forests are privately owned, regardless of their intensity of use. Most of the farmsteads of the local population are informed about the competition. Be friendly, greeting with a wave of your hand, smile, be the best diplomacy from afar. Any kind of waste, dropped wherever it happens, is unacceptable! You can leave any waste at the water stations! There are few pastures and livestock in the competition area. Most of these pastures are equipped with electric fence: a wire at a height about 80 cm above the ground, easy crossable over or beneath. Be not afraid of livestock, they are not aggressive, but curious! Some locations on the map are marked as agricultural fields. If they are mowed and cleanup, you can use them for movement, without any worries. Domestic dogs, whether tethered or free, are farmstead guards. By entering this area you expose yourself at risk! If you meet local dogs, behave naturally, continue the way forward at the same time tracking hazard with eyes. Most streams are small and easily crossed. The difficulties are in areas, where the landscape is changed by beavers. If you find the flooded site, find the nearest beaver dam, where you can cross almost dry-shoed. marked with a black line across the water stream. You will have more than 2 hours for planning, be smart, there are many choices! There are at least four different movement directions already at the start. Shape "8" - an additional reason for success!? All seventy nine CP areas are highlighted in nature and after SI station placement will be ready to welcome rogainers. All CPs are evenly distributed over competition area. Point value is granted to CP, depending on the distance from roads and accessibility. If it happens and you have reached some of 80-100, a great job will be done! Each CP site is marked with a triangular white-red prism with reflector. Prism is located at eye level, except in places where there are no trees at all and prism may be lower then usually. In case if you are in the right place and there is no usual marking, locate the tape around the tree in close vicinity, bearing the CP code: letter and number combination. Memorize, or write down, or else, as a proof of the CP site visiting! Be attentive map readers! The map is generalized according to scale, such as terrain and waters. However, there are details that reflect area very certain: green stripes - overgrown areas, especially yellow fields - open, semi-open places and clearings. Forest paths are uncertain and disappeared, clearing paths are visible and partially usefull. Some animal paths, especially along the water courses, are usefull for movement. Wherever you move, be friendly with your compass, especially at night! If organizers told something - must have - be sure this is not a joke! Never lost eye contact with team members! Protect your team members as well as yourself! 16:00 Registration and catering begins - dinner-supper. 19:00 ERC 2011 BRIEFING: questions and answers about race LIVE! 20:00 ERC 2011 OPENING CEREMONY and entertaiment. 07:00 Registration continues, SI cards attaching, catering begins - breakfast. Registration at competition centre will open on Friday, 16:00, and with some breaks will continue until Saturday, 11:00. Welcome! If your team information, composition, etc. will change shortly before competition, please, arrive to registration desk as early as possible. We cannot guarantee you to perform registration procedure instantly - time, which it takes, depends on story, what you will tell us at the desk. Thank you for cooperation! Ja jūsu komandas informācija, sastāvs, uc., ir mainījies īsi pirms sacensībām, lūdzu, ierodieties uz reģistrāciju pēc iespējas ātrāk. Mēs nevaram garantēt, ka reģistrēšanas procedūra notiks acumirklīgi - laiks, kas tai ir vajadzīgs, atkarīgs no stāsta, ko jūs mums pavēstīsiet reģistrējoties. Paldies par sapratni! Короче, если в вашей команде есть какие либо изменения - не откладывайте регистрацию на последний момент. Спасибо! Rogaining "for fun" will be held as 6 hours competition. Some votes were for 8 hours, but there were also votes for 6 hours. We are staying on initially announced duration. Have fun! 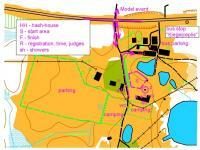 Map of Competition centre added to Event info.